This month's cover star Tommy Lee has had a ton of explosively awesome moments behind the kit. To celebrate the Mötley man's incredible skills we've taken a look back at some of his finest moments. Tommy and the rest of the Crüe may have made waves with the gritty, hard rockin' beats of 'Shout at the Devil', 'Looks That Kill' and 'Live Wire', but it was 'Home Sweet Home' that showed a different side to the already infamous US hair metallers. Starting with Lee's delicate spot of ivory tinkling, he quickly gets back behind the kit and launches into a tom intro and a simple, yet-perfectly judged, beat that becomes the backbone for one of the '80s finest power ballads. Which may sound like an oxymoron, but it's actually a compliment. Ok, not actually a beat, but we couldn't run through Lee's most famous work at the drum stool without including this eye-popping, gravity-defying solo. Admittedly the solo itself may not be technically the greatest you'll ever see and the monstrous cage that Lee is sat in has since been superseded by some far sleeker alternatives, but purely in terms of innovation and wild-eyed ambition this has to make it into the moments that defined Lee's career, especially as he has been trying to top this ever since. Has he finally topped this with his latest ridiculously huge drum rollercoaster set-up? We reckon so. Perhaps the most memorable of Lee's drum tracks. Boasting an intro beat that teams up perfectly with Mick Mars' guitar and stays locked in with the riff right until the final note. Check out this 2004 live video of the track. While the mid '90s may have seen many changes for the Crüe, one thing remained constant - the skin-pounding ability of their charismatic sticksman. 1994's self-titled album saw John Corabi replace Vince Neil and the boy's trade their pop metal sound for a hard-edged industrial grunge approach. The sugary production of the Crüe's '80s output is well and truly left behind as they go all industrial on us, with Lee opting for a stripped-back drum sound that was about as far removed from the pop rock anthems that had defined his career to date as possible. But it still rocks unbelievably hard. 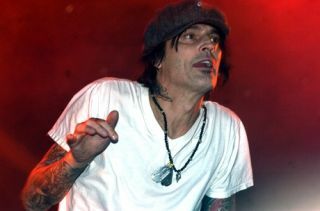 After more than a decade away from full-time drumming duties with the Crüe, Lee returned on the band's comeback album - Saints of Los Angeles - in 2008. In the meantime he had recorded with Rob Zombie and launched a solo career, which saw him take up frontman duties, but here he slots back into the old groove straight away. The record's title track sees the drummer in fine form. Of course, he couldn't come back playing a run-of-the-mill set-up, just check out the beast of a bass drum that he's rockin'! For much more from Tommy pick up the March issue of Rhythm.